Join us for an evening of music and friendship celebrating the work of Shelter Music Boston and witness the interactive concerts that inspire hope in our audiences and transform homeless shelters. Meet Mark Clough, Shelter Manager at CASPAR's Emergency Shelter in Cambridge and discover his 30 year journey that began as a homeless CASPAR shelter guest. 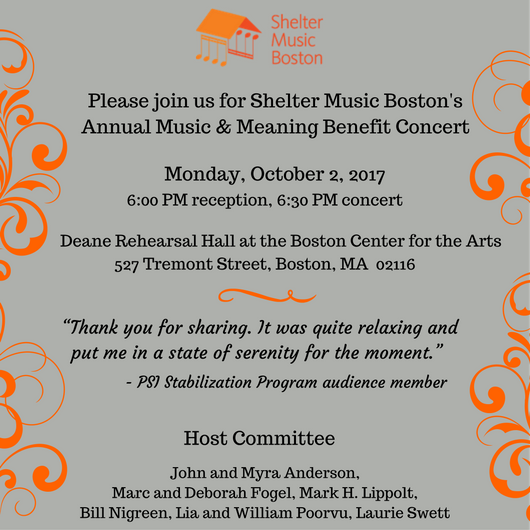 Shelter Music Boston is grateful for our generous 2017 Music & Meaning Benefit Concert sponsors.